This is a pretty rough take on the 12th Doctors gloves picture that has been floating around the internet. It’s pretty tough to tell what exactly is going on with these suckers but I took a stab at it! Hopefully you enjoy this pattern! I’m sure there will be some modifications as more pictures leak or the episode comes out. Cable Set Up: Knit 5, pm, k16, pm, k to end. Round 1: Purl to marker, sm, k16, sm, p to end of round. Round 2: Knit to marker, sm, k4, C4B, C4F st k4 sm, k to end of round. Round 3: Repeat round 1.. Round 4: Knit to marker, sm, k2, C4B, K4, C4F, k2, sm, k to end of round. Round 6: Knit to marker, sm, C4B, k8, C4F, sm, k to end of round. Rounds 7-12: Repeat rounds 1-6. Round 13: Repeat round 1. 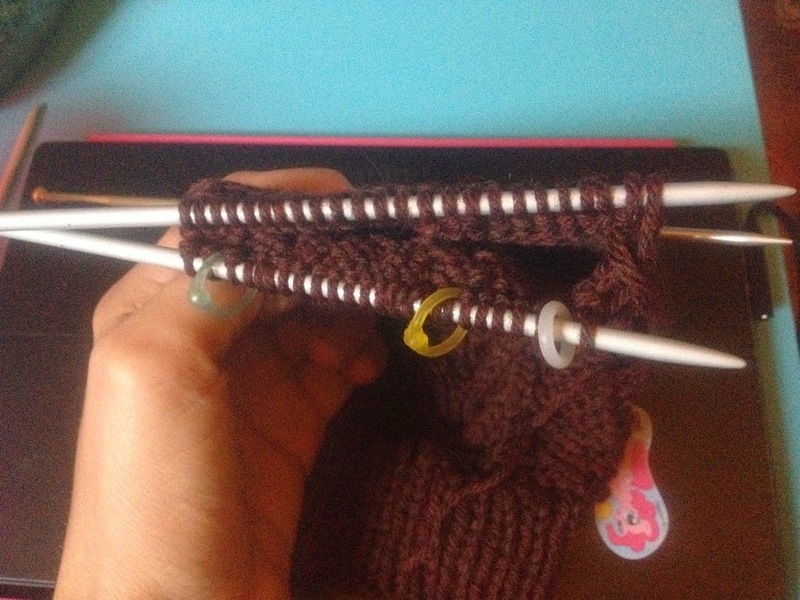 Round 14: Knit to marker, sm, k4, C4B, C4F, k4, sm, k7 m1,k1, place thumb gusset marker, k1, m1, k to end of round. Rounds 15-18: Repeat rounds 3-6. Round 19: Repeat round 1. Round 20: Knit to marker, sm, k4, C4B, C4f, k4, sm, k to 1 st before thumb gusset marker, m1, k1, sm, k1, m1, k to end of round. Rounds 21-24: Repeat rounds 3-6. Round 25: Repeat round 1. 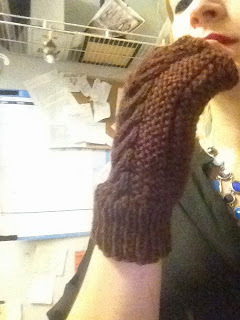 Round 26: Knit to marker, sm, k4, C4B, C4F, k4, sm, k to 1 st before thumb gusset marker, m1, k1, sm, k1, m1, k to end of round. Round 27: Repeat round 1. Round 28: Knit to marker, sm, k2, C4B, k4, C4F, k2, sm, k6 sl 7 sts to holder or scrap yarn, CO 5, k to end of round. Round 30: Repeat round 6. Rounds 31-48: Repeat rounds 1-6 three times. Slip next 24 sts to another needle. Join yarn and purl around. Repeat those two rounds once more. Slip 6 sts from front needle and 6 sts from back needle to working double pointed needles. Cast on 1 st between ring and little finger. Repeat those 2 rounds once more. Middle finger: Slip 7 sts from front needle and 7 sts from back needle to working double pointed needles. Cast on 1 st between ring and middle finger. Repeat these 2 rounds once more. Place remaining sts on double pointed needles. Cast on 1 st between index and middle finger. Slip sts from holder to working needles. PU 8 sts. Beginning with cable set up, work rows 1-13 same as Right Glove. Round 14: Knit to marker, sm, k4, C4B, C4F, k4, sm, k18, m1, k1, pm, m1, k to end of round. Round 20: Knit to marker, sm, k4, C4B, C4F, k4, sm, k to 1 st before thumb marker, m1, k1, sm, m1, k to end of round. 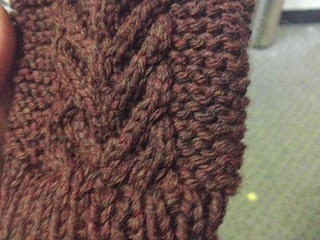 Round 26: Knit to marker, sm, k4, C4B, C4F, k4, sm, k to 1 st before thumb marker, k1, m1, sm, m1, k to end of round. Round 28: Knit to marker, sm, k2, C4B, k4, C4F, k2, sm, k to 3 sts before thumb marker, sl 7 sts to holder or scrap yarn, CO 5, k to end of round. With tapestry needle, seam gaps between fingers together. Weave in all ends.